Our reunion was held in conjunction with the Tin Can Sailors (TCS) at the Marriott Hotel Downtown in Portland, Oregon. Total attendance by destroyer veterans and guests was about three hundred. Forty shipmates and guests represented GOLDSBOROUGH. Tours offered by the TCS included City of Portland, Multnomah Falls, Train ride to Mt. Hood, Willamette River Cruise and the Chinese and Japanese Gardens. The Tin Can Sailors provide us with our own hospitality suite that provided us the opportunity to gather together to not only renew old friendships but also develop new ones. Pat Taylor provided many Goldsborough items for our ship’s store at very reasonable prices. Pat Taylor and Bob Shanahan are developing a ship’s store catalog and order form that will be available on the GOLDSBOROUGH web site soon. In addition to the three meals provided by the TCS, we had our own banquet at the River Place Hotel. Many thanks to Jack and Jim Maguire for arranging the banquet, and reserving the room for our business meeting and auction. Jack Maguire was reelected to a second consecutive term as Secretary/Treasure. Tom Weaver and Bob Shanahan were presented plaques in appreciation for their outstanding contributions to our association. 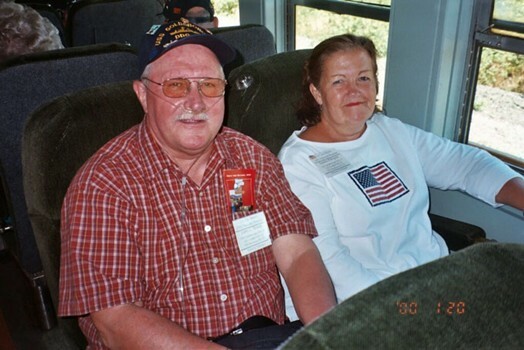 Retired Captain George Sullivan (XO 70-71) and Roberta Sullivan attended from their home in Hawaii. Captain Sullivan is presently Chairman of the Arizona Memorial Museum Association in Pearl Harbor. The membership voted to donate $250.00 to the museum association. The members voted overwhelmingly to meet in San Antonio, Texas for our fifth annual reunion. During the 2002 reunion in Virginia Beach, Pat Taylor enthusiastically volunteered to coordinate the 2004 reunion. Pat has done much research and made many contacts in the San Antonio area. He will be making a pre- reunion visit to finalize many arrangements that must be made. Pat is determined to make the 2004 reunion a memorable experience for all of us. Pat will be disseminating information as soon as it is available. It is not too early to start making plans for joining your shipmates in San Antonio.